The new hens (pullets..hens just now old enough to lay eggs) are doing beautifully. When we put them in their pen last week they took dirt baths and ate grass..they knew right away what to do. Now they are settled in, and we are getting about 4 eggs a day from these 19 girls. All heritage birds, they do not produce an egg a day like production birds. In the Row Toe Tiller between the garden rows they are tearing it up. And the thin little leaves? 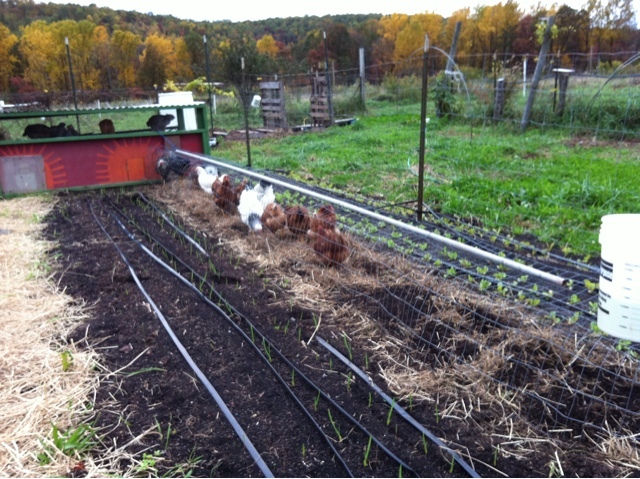 Garlic, planted a few weeks ago, will be ready for 2012 CSA boxes next spring/summer..